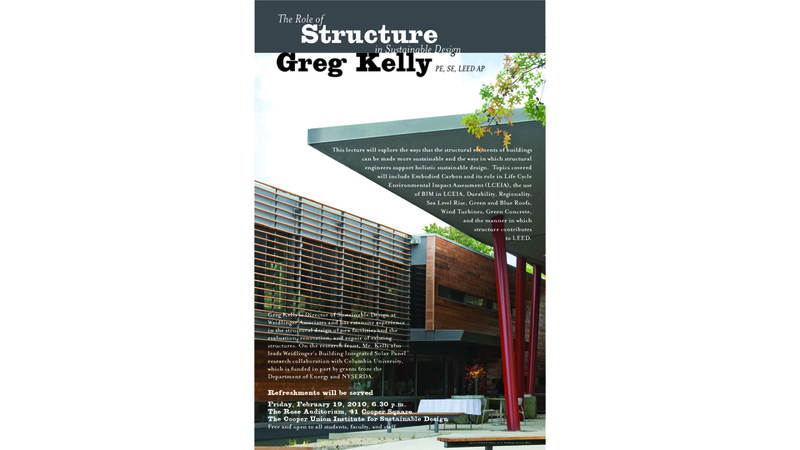 Greg Kelly "The Role of Structure in Sustainable Design"
Mr. Kelly has extensive experience in the structural design of new facilities and the evaluation, renovation, and repair of existing structures. Since he gained his LEED accreditation in 2002, Mr. Kelly has increasingly focused on the role of structures in sustainable design and he currently Director of Sustainable Design at Weidlinger Associates. Weidlinger’s Sustainability Initiative researches sustainable structural and civil design strategies and technologies and brings this knowledge to the firm and its clients through a comprehensive education program. This education program provides classes and seminars on green and blue roofs, green concrete, and other sustainability topics as well as reference materials on sustainable structural and civil design. Mr. Kelly also directs the LEED Consulting Services that Weidlinger offers as a compliment to their core Structural, Geotechnical, and Civil services. The firm is currently acting as LEED consultant on the Liberty Island Retail Pavilion, a project that is on track to receive a LEED Platinum certification. On the research front, Mr. Kelly also leads Weidlinger’s Building Integrated Solar Panel research collaboration with Columbia University, which is funded in part by grants from the Department of Energy and NYSERDA.